The Orange Essence Bouquet is a bright and sunny way to celebrate any of life's special moments! Bringing energy and beauty straight to your special recipient's door, this fresh flower arrangement unites orange roses, gerbera daisies, carnations and Peruvian Lilies along with lush greens, to create an incredible gift of flowers. 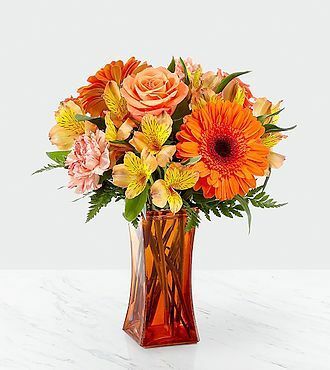 Presented in a modern orange glass vase to give it a polished and finished look, the flower bouquet is a wonderful way to express your happy birthday, thinking of you, or congratulations wishes. STANDARD bouquet is approximately 13H x 11W. DELUXE bouquet is approximately 14H x 12W. PREMIUM bouquet is approximately 15H x 13W.